It's known as the tardigrade, or water bear, and scientists think that this animal will survive humankind's extinction. It’s a tiny little animal, but it is virtually impossible to kill, and scientists think it may one day outlive us. 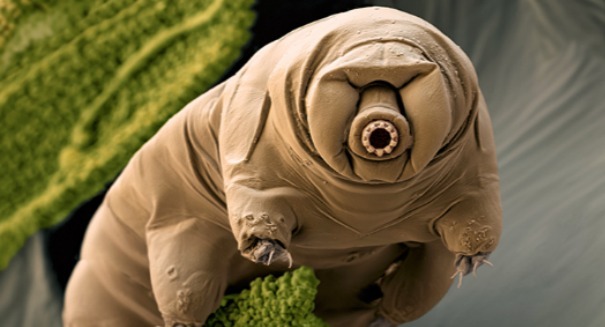 It’s the tardigrade, also known as the water bear, and these minuscule animals may not look like much, but they’re a lot tougher than we fragile humans are, the University of Oxford said in a statement after publishing a new paper on the animal. Tardigrades have been known to survive the toughest conditions possible, including extreme heat, temperatures just barely above absolute zero, and even the vacuum of space. They’re known as the toughest critter on the planet, and this new study claims that they may very well be the last survivors of Earth, still kicking even after all the other creatures on Earth – including us – have perished. And the tardigrade has lived for a very long time, certainly longer than the million years or so we’ve been around. Scientists have found tardigrade specimens in sediments that are dated between 100 and 520 million years old, so they’ve been around since the dinosaurs.